Day 23: Solitaire to Fish River Canyon - Another terrific day out on the range... everyone has been carving their way southwards across the vast prairie of Namibia's desert, finally arriving at Canon Roadhouse for a coffee pit-stop and a top up fuel. It has been a long day to this spot, where we have finally ended up a short run from the dramatic cliffs of Fish River Canyon. Canon Roadhouse has a collection of rusting relics from the late 1930s, mostly Chevrolet saloons, coupes and worn out trucks, plus a very rare eight-cylinder Lincoln. Some wrecks even decorate inside the cafe, festooned with photos and automobilia on the walls. This proved an excellent place to sight the final Time-Control of the day. It's been a dramatic day for some. News of car 16, the Lovett's Porsche 911, is still sketchy, but informed sources close to the sweep mechanics suggest that early this morning the rear suspension collapsed. With a tyre resting on a wing, Peter felt forced to sadly retire the car that finished a strong second in the Classics section of the last Peking Paris. The crew are flying from Windhoek to Cape Town, with the Porsche now being shipped home. As for our other Porsche, the little 356, David and Julia Harrison stopped in Bethanie, a small farming village, where they easily found help found help to fix a puncture. The one pump filling station couldn't help crews with fuel as the entire village was suffering from an electricity power cut, so the pump attendant turned his hand to sorting the Porsche's tyre problem instead. Also cracking a suspension wishbone today was the De Sousas' Volvo 144, veteran of many marathon events, but the Volvo can hopefully be welded, so the crew are optimistic of making the finish in Cape Town. The final few days of the event have upset the positions at the top of the leader-board as the reliability-factor is now coming well to the fore, and influencing the final outcome. For example, the 1800 Landcrab was limping along today, a rear shock absorber having broken away with its top mounting having torn itself off from the bodywork - an issue down to a simple lack of reinforcement of the area that has to absorb a lot of stress, a problem we see repeating itself regularly on long events. The crew of car 6, Scott and Salome Poroulis, were looking happy tonight - the Chevrolet Bel Air having cured problems with its automatic gearbox, but it continues to emit ominous rumbling noises. Our route today took in a short 11km Medal Section, mostly all uphill on a twisty gravel main road, free of traffic. Quickest was car 20, the Ford Falcon of Dennis Varni, who beat the Mustang of Mike McInerney by two seconds, in third place came Jose de Sousa in the Volvo was two seconds adrift of the Mustang. Fourth was car 26, the Lancia Fulvia of Gianmaria Aghen. We are due to finish on Monday. Our finish line is south of Cape Town, at the beach where the Atlantic meets the Indian Ocean. But first we have to finish our North to South crossing of the world's oldest desert, taking in the final two Medal Sections along the way, and then cross the frontier into South Africa for a breath-taking run through the Cederberg Mountains - a drive planned without timing so everyone can fully savour the remarkable scenery of this gravel road. The sting in the tail of this month-long road trip is finally reaching the Cape of Good Hope, while hoping the tow rope remains untested.... and celebrating together in the long bar of the Cape Grace, where we had all set out from on May 2nd. Finally: we are sad to report the untimely death of Steve Hyde, who had planned to join us before becoming too poorly to drive. Steve made a remarkable impact on the world of historic rallying, as well as making a large number of friends. His first event was the Nile Trial in 2009 driving a Jaguar MkII, a year later he won the Peking to Paris, driving a 1937 Chevrolet Fangio Coupe. Steve regularly dropped in to visit the team at the Rally Office - always cheery and always looking forward to the next event. A great character, he will be missed by many. Our sympathy goes out to Janet, who nursed Steve to the end with the kind of dedication only real love can provide. Day 24: Fish River Canyon to Clanwilliam - This is the longest day of the event - with an excellent start to the day on very remote gravel roads for two time trial Medal Sections, tracks also used on the ERA’s London to Capetown Rally a couple of years ago. 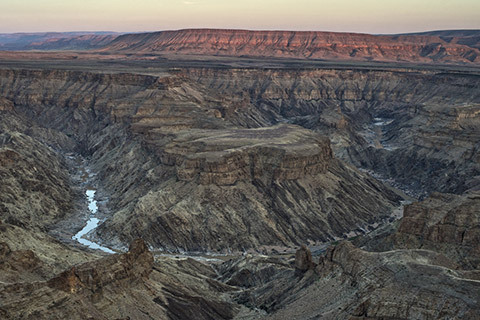 The day began with the sun rising over Fish River Canyon, an enormous gorge carved over millions of years by the Fish River, a sort of Colorado Grand Canyon without a single tourist in sight. This is the second largest canyon in the world. It was an early start today with over 500 kilometres to get under our wheels to reach Clanwilliam, on the start of the final section through the Cederberg Mountains. On the first Medal Section, again it was the V8 Ford Falcon of Dennis Varni who set the best performance, pipping the McInerneys' Mustang easily by 22 seconds - the Mustang crew had been complaining of serious steering issues overnight, suggesting to the sweep mechanics ‘only one wheel seems to be doing the steering” - not that anything seems to slow this crew. 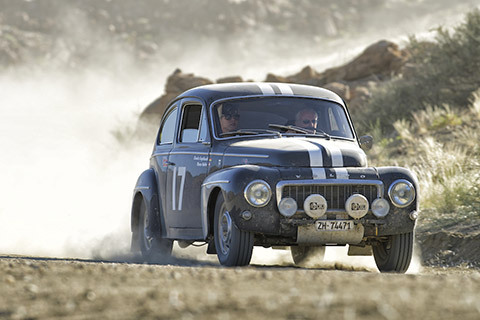 In third place was the Volvo of Jose de Sousa, one second adrift of the Mustang, and fourth was taken by the little Lancia Fulvia, fighting hard to the end. On the second test - which features in the opening sequence of the film of the London to Cape Town, which ends with a series of undulations and blind crests that sees any car seriously trying yumping with air under the wheels, it was the Mustang that set best time, romping well on 14:33, beating Varni’s Ford which has a similar engine which posted 15:16, Bill Clyndert threw caution to the winds of Namibia and hurled the heavy BMC Landcrab at the track to finish on 16:30, taking third place, with a joint finish for fourth, the Lancia and Volvo PV544 of Marco Halter and Claudia Engelhardt matching the time of the Italians. Two British sportscars have impressed with their consistent reliability so far on this event: The MGB, car 27, John and Marian Crighton, has been well prepared and run so far like clockwork despite its limited suspension-movement, and the well developed red Triumph TR5 of David and Jo Roberts. This car is probably the most well-travelled Triumph in the world, and is now a veteran of long distance marathons on at least five Continents… the smooth-sounding engine sounds glorious when accelerating away from time-controls and is a tribute to the diligent time spent in a workshop before the event, it carries nearly as much ground-clearance as the little Lancia, which looks as if it could clear three house bricks stacked on top of each other, and also has been largely trouble-free. The Lancia was built up from a bare shell to Safari specification for the last Peking to Paris. 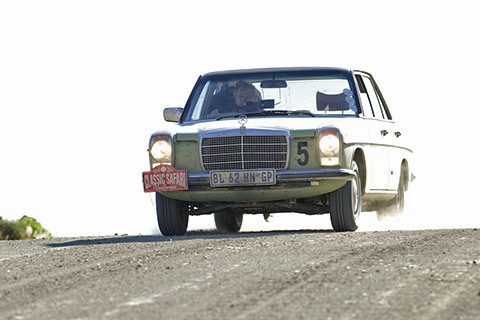 If there was a special award for the biggest drama of the day it would go to the German Udo Bichler, who today slid wide on a gravel bend and beached his Mercedes 230 saloon in the bushes. With all four wheels sinking into soft sand, having missing several large rocks by inches, he had to wait for a tow from the Long’s who are travelling in the Hertz Class - a 4x4 rental car, which they describe as "dead boring". Soon after posting the slowest time of the day as a result of this mishap Udo, who is competing on his own after his wife decided to return home due to family commitments, then limped through the second test suffering from a rear puncture. Tomorrow is our last day - Cape Town’s table-top mountain and the waters off Cape of Good Hope signal the end of an event which Bentley driver Keith Ashworth has described as "the best event I’ve ever driven".